In Chapter One, three people receive a mysterious letter. They are told not to show the letter to anyone or to contact the police. If you had received this letter, what would you have done? 1. Below, double click on the DOWNLOAD FILE tab for the Detective's Journal (Tab # 1)). 2. You will have a choice to OPEN, SAVE, or CANCEL. Select SAVE. 3. Name the document Detective's Journal 1 and SAVE to your documents file. 4. Open the saved file. Click on TYPE HERE and type in three things you could have done if you had received the letter. You may share ideas with other members of your group. In Chapter Two, you learn that Calder likes pentominoes. Click on the Pentominoes link http://www.scholastic.com/blueballiett/games/pentominoes_game.htm to have some fun with pentominoes. In Chapter Three, you discover that Petra was named for an ancient stone city in Jordan. She was pleased to be named after a mysterious place of buried secrets. 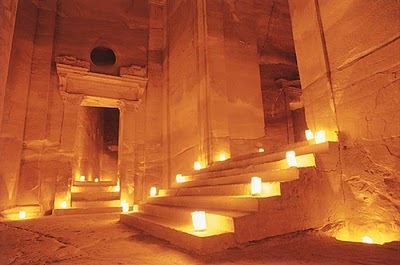 The picture above is of Petra. You can see that it is also a beautiful place. 3. Ask questions or talk to another group member if you read something you don't understand. 4. In your Detective's Journal type five sentences about what you have learned. 5. Save Detective's Journal 1.